The features come insensibly to be formed and assume their shape from the frequent and habitual expression of certain affections of the soul. These affections are marked on the countenance; nothing is more certain than this; and when they turn into habits, they must leave on it durable impressions. No one will tell a tale of scandal, except to him who loves to hear it. Learn, then, to check and rebuke the detracting tongue, by showing that you do not listen to it but with displeasure. Cold hearts can find warm words. You know, the more you can meet people from different walks of life, the better it is for you. I think the more you can create situations and experiences that give you new perspective, the better. Nothing leaders do is more important than hiring and developing people. At the end of the day you bet on people, not on strategies. Want and sorrow are the wages that folly earns for itself, and they are generally paid. 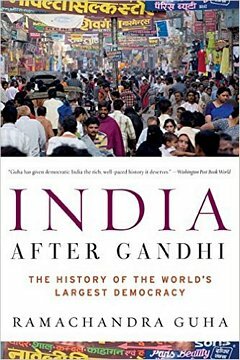 Historian Ramachandra Guha's chronicle of the political and socio-economic endeavors of post-independence India, and its burgeoning prosperity despite cultural heterogeneity.